I've been working very building up a stable and strong DarkOT. now, DarkOT and MasterCores are two completely different games in aspect how it should be enjoyed. The general plan behind bringing DarkOT back from the yearlong sleep, is to amplify the fanbase. DarkOT and MasterCores will walk hand-in-hand in advertising. This means, that when people have gotten bored of grinding in MasterCores, would move over to DarkOT for some action. 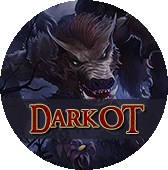 Or when people get tired of the unserious aspect of DarkOT would move over to MasterCores for a better and prolonged RPG feeling. DarkOT isn't about splitting the community in MasterCores, as some people might think. It's about offering more variety of our games, an attempt to make our community not to get split towards our competitors. And in general, making a bigger community between MasterCores and DarkOT. Some people have tried to start rumors that I abandoned MasterCores and used DarkOT as proof of it. I haven't abandoned MasterCores, and never will, content updates are planned and will happen later on. More places, creatures, items and quests will come with the next content update. We're still planing on expanding our game around the world again, Australia, Asia, Brazil.. But those plans will have to wait until MasterCores has grown enough to be able to handle the costs and there's enough players to fill the worlds sufficient enough for a stable world-community. People trying to make these rumors that I abandoned MasterCores, have done this before. This is actually the third time they blame me for abandoning MasterCores since October. First time was in December while I was focused on finishing the winter update (Heimdir). Second time was when I didn't login anywhere for 4 days while being sick in Febuary. To be honest, there will be times me/staff may appear gone for some time (days/weeks). This doesn't mean me/anyone abandoned MasterCores, it just means that we're either having a little vacation or that we got our hands full elsewhere. And now we're moving towards summer, which means internet will nearly die down because people are going to be trying to enjoy the summer and not sit on a screen all days. For myself, I'm going to have vacation whenever the weather is pleasurable and then I'll be here working on MasterCores/DarkOT whenever the weather is crappy (rainy etc). So please, don't panic because things may be slow sometimes, there will be plenty of times things move slow. In general, October-February is peak times of activity, (which I'm almost working 24/7). May-August is slow period, when not much happens on internet. For fun, in November last year, I spent 450 hours working on MasterCores, a month fulltime job (40h/week) is 200 hours for a month. I hope you guys understand what's going on, and that we will never close or abandon MasterCores! I don't know much about DarkOT, but it sounds awesome. Smart move! A large majority of the people who play Tibia in the world are from Poland or South America. Meh, there'll always be people saying so if they don't get their weekly dose of updates. Most of us believe in you and the staff. Thank you for a great game and good luck! It's fine for me as long as you keep Mastercores up and running fit. People will complain either way but what we saw in the past few months is that there isn't a simpply way to attract new players and we do need more people. I really hope it attracts a new player basis. Talking about myself I'll be glad to have fun in BOTH servers. I don't see it as competition but more like complementation. Can't wait to start playing on DarkOT! This is your marcus choice, and I do not criticize it, but I think it's time to upgrade the mastercores. people will know about darkot and will be directed to mastercores. You do realise I haven't made any profits on MasterCores since mid-December? Right now it runs on my wallet. Check your facts before blaming me for being money hungry. @ marcus i like your server.. a few new "own" Monsters would be cool. Cool, and what is the host for darkot? Eu? Na? No response from Staff about moving server more south?!?!? Ridiculous. They have already said that many times it will be moved if there are more players (my guess is 100 players avarage). You are not saying truth so please stop with that. scroll up the thread to find marcus' response to the entire matter you are refering to. also to everybody else with this question as I had seen it pop up a lot on discord, ingame, and on the forums.. The invite process will begin tomorrow. We had a closed test today to find some game-breaking issues that would otherwise deter players from even participating in the initial closed test. One issue in particular affected the game client and was patched out an hour or so ago, thankfully we don't have to worry about these things when a Public Test is available. Our closed group of players have tutor status so they can report bugs as they play test the game, it is likely that any new invites will receive the same status to help the testserver run smoothly and help everything go according to plan but if not any and all problems or issues with DarkOT can be posted about in its Support Forums or via Support Tickets. I'm with you, dear Lunatone! Good to see DarkOt back again, with all these additions the staff've made. We gonna have a good time there, I'm sure of it. One question: can I stay with my 3 chars logged in MasterCores and still play with another 2/3 in DarkOt? how can i get a invite test code?